Recently I was asked if it was possible to paste link an image into PowerPoint so that if the original image is ever updated, the image in PowerPoint would automatically reflect the change. Sadly, PowerPoint cannot do this, but there are some types of source files that can be Paste linked. Let's say, for example, that you have been sent an Excel spreadsheet for your PowerPoint presentation with the first and second quarter earnings. The spreadsheet has been left blank until the numbers for the remainder of the year are received. By Paste Linking the data into your presentation, the information in your presentation will automatically be updated when the Excel spreadsheet is updated. 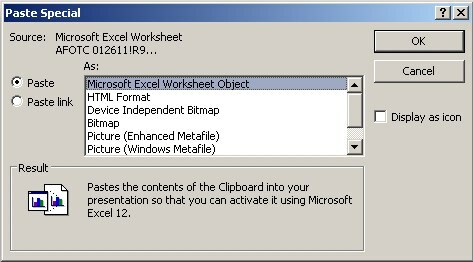 To know if something will Paste link into a PowerPoint presentation, first copy the object to the clipboard. (If you are copying from another Office program, make sure that the document has first been saved.) In PowerPoint, click the Paste button from the Home tab and choose Paste > Paste Special. If Paste link is available at the left side of the Paste Special dialog box, you will be able to Paste Link. If you were able to Paste link, try making a change to the content you have copied (in this example you would be editing the Excel spreadsheet) and then save your work. In that case, the content in the PowerPoint slide will automatically update. About the author: AJ George is IconLogic's lead Technical Writer and author of both "PowerPoint 2007: The Essentials" and "PowerPoint 2008 for the Macintosh: The Essentials." This technique is amazing. You can do this also with charting objects from excel. If you create a graph in Excel and use the Paste Special option, your chart will change (even the formatting) when you make changes to the source file. We have created two simple tutorials where you can see the technique in action. There are free downloads at the end of each article.